Which is the Best Quiet Portable Generator for You? We know how hard it can be to shop for a good portable generator, let alone a unit that actually lives up to the quietness claims on the box. That’s why we came up with a special guide just for finding the best quiet generators on the market. We’ve combed through all our favorite portable generators to find the models that cut the noise back to a minimum without cutting corners on performance or quality! For this guide, we’ve chosen 3 top models to recommend to you. They’re some of our favorite generators on the market, period. The fact that they’re incredibly quiet just happens to be a massive plus! Our in-depth reviews will take you through everything you need to know about these machines. We’ll discuss all the key features, and show you why these trump the competition. Then, we’ll help you figure out which is the best choice for you! 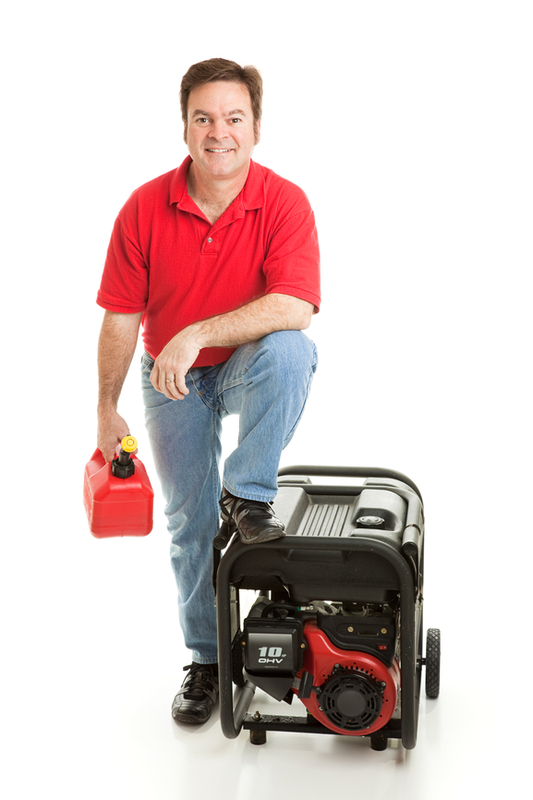 Portable generators are one of the most convenient, versatile machines you can buy! They’ll give you power pretty much anywhere, whether you’re backing up your home or powering up your camper at the site. However, most gasoline generators have one major downside: they’re loud. Excessive noise from your generator can put a real damper on your tailgate party, and keep you from sleeping through an outage at home. That doesn’t have to be the case! Plenty of companies are offering quiet and ultra-quiet models that offer plenty of power at reasonable noise levels. If you’re using a power source close to your camper or for your next outdoor party, they’re the best buys! So, let’s have a look at the quietest competitors on the market! Our most affordable choice for a quiet portable model is a newcomer on the market: the Powerhorse. Powerhorse isn’t one of the most widely-known brands in power tools, but they’re quickly earning a reputation for their value-priced, high-quality tools and accessories. This model is a compact, unobtrusive unit that’s perfect for tailgaters, outdoor craftsmen and DIYers, or taking on camping trips. It’s our top choice for people who are looking for a low-noise, low-cost solution for small applications. It’s quiet. The Powerhorse keeps its running volume to a very impressive 52 decibels, which is lower than the accepted threshold for normal conversations. That means you can barely hear it running from inside a house, or from a few yards away. It’s an excellent choice for campgrounds, or for outdoor parties. It’s much more stable than other budget models–in fact, it competes with premium models where stability is concerned! This unit produces power with less than 1.5% THD (total harmonic distortion). That makes it ideal for powering more sensitive gear like sound systems at a barbecue, or charging tech/communications gear on a worksite. It uses copper-wound machine heads to run continuously without overheating or causing motor damage. Cheaper aluminum heads can overheat and force your whole generator to shut down, and they’re what you’d normally find at this price. The Powerhorse uses surprisingly high-end components to give you better all-day runtime. It’s easy to add oil and perform routine maintenance, thanks to the removable side panel. You get three outlets to choose from. There are two standard 120V household ports, and one 30A locking 120V socket. That makes it equally good for typical appliances and work-site-style power tools. You can link two units, to produce double the total output! That’s ideal for people who will be using this for construction or carpentry projects on the go, where they will need different capabilities for each project. All the cables are included, which makes for a very expandable setup. It produces a lot of power for its small size. 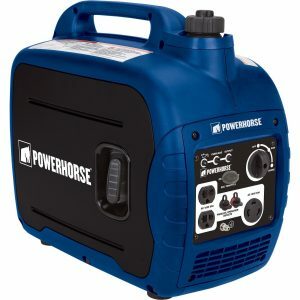 The Powerhorse runs at 1600W, and has a starting output as high as 2000W. That higher starting output is key for starting appliances like large A/C units, which might ordinarily require a larger machine. 1600W of running output is plenty for running several power tools, or a fridge and several smaller appliances in a camper. It’s compact. The Powerhorse is under 2 feet long, so it’s very easy to fit in the back of the car, truck, or camper for the road. Previous buyers said that in terms of reliability, build quality, and power stability, this one easily competed with machines twice its price. We found that many reviewers said they’d been using this model on a daily basis for years with no issues whatsoever. Buyers said it starts every time, gets very decent fuel economy, and provides plenty of power for smaller applications. It’s pretty inexpensive. This unit costs about half of what you’d pay for a comparable Honda or Yamaha. It’s not meant for larger applications. The Powerhorse can start and run smaller A/C units, and it can run an RV fridge handily. However, it can’t run many of those larger loads simultaneously. If you’re thinking about this is a camping power source, make sure you don’t need more than 1600W of power for your total load at any given time. Most tailgaters and power tool users shouldn’t have anything to complain about in terms of output. Since Powerhorse is relatively new to the scene, they don’t have as much of a track record to look at as Honda or Yamaha. We’ve heard mainly good things about Powerhorse machines in terms of reliability and long-term durability, but we simply don’t have as much of a legacy to draw on as the big name brands. That makes these a bit less of a reassuring purchase. 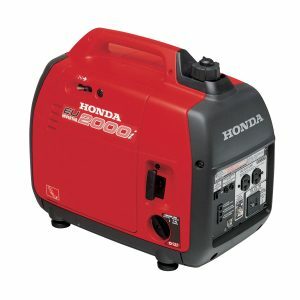 Our top midrange choice for a quiet portable generator comes from Honda, one of the most respected brands on the market. It’s an even smarter, quieter alternative to the Powerhorse for smaller applications. The Honda is lighter, smaller, and easier to carry around with you. Plus, it’s backed up by one of the best reputations of any power tool company. Honda machines are legendarily reliable, efficient, and durable, and this is no exception. We think it’s the best choice for people who need something small, and want the absolute best quality and quietness. It packs a lot of power in its small package. Like the Powerhorse, it has a 1600W running output and a higher 2000W starting output for kick-starting larger appliances like an A/C system. Just like with the cheaper model, the Honda can also be paired with a twin unit to produce twice the total output. It’s even more compact and portable than the Powerhorse. The Honda is just 20 inches long, and It’s lighter too, weighing in at just 46 pounds. For carrying a generator to a campsite by hand, or fitting it in a tightly packed camper, there’s really nothing better. It’s very efficient. At ¼ load, it runs for about 8 hours, which is the same as the Powerhorse. However, it really excels at full-load performance, where this one can run for 3.4 hours on a single tank of fuel! As far as we know, that’s the best fuel economy on the market for a generator at this scale! It’s very quiet. The Honda operates between 52 and 59 decibels, the same range as the Powerhorse. Because it’s more efficient, it stays on the lower end of the spectrum more than the Powerhorse, so it ends up being even quieter to run. It’s extremely reliable and easy to start-much more so than other small portables we’ve used. Buyers said it started the first time–every time. There’s a 12V port for charging batteries in backup power units, cars, or other machines. It’s especially handy to have around a garage, or for when your RV’s battery dies on the road. It has an automatic shutoff feature to protect the motor in case oil runs low. The Honda will turn itself off to prevent any burnout damage on the motor, so you never have to worry about leaving it running too long. There’s also a warning light to remind you to refill the oil tank. By contrast, the Powerhorse has a warning light, but it won’t shut itself off. It’s sturdier than the Powerhorse. While most buyers didn’t have any durability complaints with the Powerhorse, a few did note that it’s built from lighter plastic than they’d hoped. The Honda is rugged and durable, and reviewers were very complimentary about its build quality. It’s covered by a 3-year warranty, which is good for both residential and commercial use. That’s a huge advantage over the Powerhorse, which has a shorter warranty that’s only good for residential applications. While the Honda is slightly better than the Powerhorse in each of its specs, its biggest advantage is its pedigree. It comes from a brand with a great reputation for quality. We’ve heard mainly good things about the Powerhorse lineup, but we have a very high level of confidence in this Honda. The extra lifespan, reliability, and low-maintenance performance that comes with a brand like Honda is well worth the larger price tag for us! It’s one of the most expensive options at this scale. We think the Honda’s superior portability, reliability, and durability make it worth the price difference over the Powerhorse. However, we’re well aware that many people will disagree with us. Some buyers simply can’t afford to spend $1,000 on a small-scale portable generator, no matter how great it is. This one doesn’t come with a 30A worksite outlet. That’s not a dealbreaker for us, since the sort of power tools that use 30A sockets generally require a larger generator anyway. Still, it might be disappointing for people who are planning to use their generator with locking sockets. As with the Powerhorse, the Honda EU2000 can’t handle several larger loads all at once. It’s strictly for small-scale applications, unless you’re going to use it in tandem. Our ultimate pick for a quiet portable generator is this full-size Honda unit. It’s more than capable of backing up your house essentials in an outage, and it makes an extremely capable power station for busy worksites and outdoor parties. At the same time, it’s much quieter than other 7000W options, and it’s much more efficient in terms of fuel consumption. We love it for its balance between rugged construction and smart design. If you’re looking for a full-scale portable generator which works quietly and reliably, this is the one for you! It’s the most capable generator here by a long shot. The Honda produces up to 7000W, which is more than enough to keep your fridge, furnace, and other large, key appliances running through an outage. It’s also the best choice for people who are looking for a single power source for a busy worksite, or campers looking to run larger A/C units or other big RV loads all at once. It’s one of the most powerful generators that keeps noise under 60 decibels. Although this is more than 3X as powerful as the EU2000I, it manages to have the same operating noise level! That’s some seriously impressive noise reduction, and it’s a good 10 decibels quieter than most of the competition. Like the other Honda, it can be run in parallel with another unit to double the overall power output. It’s very efficient. The EU7000I can run for up to 18 hours on a single 5-gallon tank of fuel, depending on the kind of load it’s powering. At full-bore, this one can run for 6 hours on a full tank. That’s much more efficient than other 7KW options, and previous buyers said they really appreciated the difference. They said that the Honda was not only more efficient than other big units, but it was more efficient than their smaller generators too! A lot of its efficiency is thanks to the fuel-injected motor system on this machine. It works more like a modern car engine than a traditional generator, and the EU7000I is actually the first Honda generator to use the design. The result is a more efficient machine which uses less fuel and needs to be serviced less frequently. Plus, there’s no choke for you to fiddle around with. This one starts more reliably, burns less fuel, and runs more smoothly thanks to the injectors. It has an electric push-button start. It’s a lot faster and more convenient than a pull-cable starter, and previous buyers said it was extremely reliable-even in colder conditions. It’s very intelligent. This model has a monitor and display system built in. It gives you readouts on your power output, RPM, and runtime at any given moment, and it’ll warn you when you need to fill the oil or perform maintenance. Like the smaller Honda, this one will also shut itself off in case oil gets dangerously low. The computer can also be hooked up to a laptop so that a mechanic can get a quick diagnosis-just like your car. It’s all self-contained. A lot of cheaper 7000W have lots of exposed parts and components, which means that they’re easy to damage on a busy worksite. The EU7000I is covered by metal plating on each side, which keeps all the internals safe from stray hardware and other debris. Even though it’s a larger generator, it’s designed to be easy to move. This one has folding arms built in, which work like a wheelbarrow to help you shift the Honda around. We like the 2-wheeled design better than 4-wheel frames because it stays in place much better on uneven surfaces. It’s recommended by Consumer Reports, and it’s extremely well-rated by previous buyers. Previous buyers said this was definitely the most they’d ever spent on a portable generator. However, they also were quick to say that they could see and feel that they were getting their money’s worth every time they used the Honda. Reviewers said that in terms of both the thoughtful design and rugged build quality, it was easy to see the big improvements between this and the cheaper options. If you use your generator regularly, at home or at work, this is the best option for you. It’s big, and it’s heavy. The Honda weighs more than 250 pounds, so you won’t be able to pick it up by yourself. It’s a better choice for people who will just be rolling it around at one site, or for work crews who can lift it together. It’s expensive. The EU7000I costs around $5,000, and we know that’s hardly a casual purchase. It’s one of the most expensive units in its power class. We don’t recommend this to people who won’t use their portable generator frequently. It’s a better choice for contractors who use a portable generator on a daily basis, or homeowners who live in locations with frequent outages. Even if you don’t have frequent power outages in your area, the Honda makes for ultimate peace of mind for those people who simply want the best portable home backup solution, and don’t have a tight budget. The Powerhouse is the obvious buy for anyone shopping for a smaller generator on a tight budget, since it’s half the price of the Honda. It provides the same amount of power as the Honda for close to the $500 mark, which is a very reasonable price tag for something as well-built as the Powerhorse! It’s more durable than other budget generators, and performs excellently for smaller installations. We think it’s a great choice for campers and tailgaters looking for a quiet performer on a budget. It’s also a good choice for people who need a generator to run a couple power tools on a worksite, since it has locking outlets. However, given how new this model and its parent company are to the market, the Powerhorse simply doesn’t have the reliability record and reputation for quality that the Honda does. It also has a shorter warranty period, and slightly lower fuel efficiency. The Honda EU2000 is our top quality choice for smaller installations like campers or outdoor parties. It’s even quieter than the Powerhorse, and it’s more efficient to boot! It will work well for outdoor DIY projects or professional construction jobs where you need to be able to run a couple of power tools. This one’s also our top choice overall for campers and RVs, since it’s so quiet and compact. We think that if you’re looking for the best balance of quiet and power for small applications, the EU2000 is the best choice for you. Plus, it’s backed up by a legendary reputation for quality in the market and a 3-year warranty, which is one of the best in the industry. The only downsides to the EU2000 are the high price and the small size. While it makes an excellent generator for smaller things, it can’t back up a house or run a whole worksite by itself. 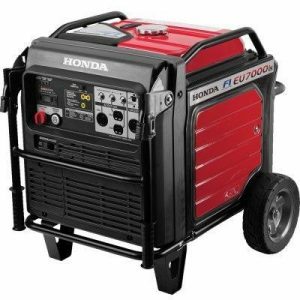 The Honda EU7000I is the best choice for people shopping for a quiet full-scale portable generator. It’s just as quiet as the EU2000, but cranks out more than triple the wattage. It’s the best choice for people looking for a quiet, portable home backup, or a low-noise generator that can run a worksite or jumbo RV with lots of amenities all by itself. It’s the only one of our recommendations that can keep several larger loads (like a fridge or A/C system) going at once. Plus, it’s the most efficient generator here, thanks to the fuel-injection system. We’ve recommended this model as our all-time favorite portable generator, and its best-in-class quietness levels make it a shoo-in for our top spot in the quiet category, too! This is a very expensive model, though, so we recommend it mainly to people who will use it frequently. The most important thing to consider when you’re choosing any new generator is the amount of power you actually want to generate. Think about how you’ll be using your generator. Are you going to be backing up your home during an outage? Powering your RV amenities at a campsite? Supplying power tools on a jobsite? Whether you’re doing one or all of those things, make sure you figure out how much power you’ll need at any given time. You’ll want to crunch some hard numbers as far as the wattage and voltage of power you’ll need. Look at the power ratings on your appliances and tools, and consider whether they’ll be running at alternate times or all at once. The highest wattage number you’ll need at any one time should be your benchmark for shopping. Do yourself a favor up front and round up your maximum. That’ll account for the fact that generators are rated at the very max of their capabilities. You don’t want to push a generator to its limit if you can avoid it, and in most cases, those ratings are somewhat optimistic. Make sure your generator can handle your total load at any given time, and give yourself that extra space at the top of the power margin to make sure your machine won’t overheat over a few hours of runtime. So, we recommend rounding up by 20-40% when you’re coming up with your power benchmark. You’ll want to buy a generator with a running wattage slightly higher than your overall total. For instance, if you want to run a mini-fridge, TV, and a fan in your camper, you’ll probably be looking at about 1000W. You’re better off buying a generator around 1600W or so, to give yourself some leeway. It’s also important to pay attention to the running wattage of a generator as opposed to the starting wattage. Most machines start at a slightly higher wattage than they produce when they’re running for an extended time. For instance, a 7000W generator probably starts at 7000W, but when it’s running steadily, it’ll actually produce somewhere around 6500W. So, it can start larger appliances that need an extra initial kick, like A/C units, but it shouldn’t be loaded with more than 6500W at any given time. In addition to wattage, you should be aware of the voltage and amperage you’ll need to supply. Most appliances run on standard 120V household electricity, and all generators have 120V outlets. However, some bigger power tools and appliances run on 240V, and only certain machines can provide that higher voltage. Likewise, if you need to use locking sockets, like 20A or 30A sockets, you should make sure your generator is compatible with those plugs before you buy. You’ll see noise levels rated in terms of decibels. The lower the decibel rating, the quieter the generator will be. Most have a range of decibels in the rating, since they can be slightly louder or quieter depending on the amount of power they’re producing. Quiet portable generators should have ratings under 60 decibels. That’s a solid 10-20 decibels (or more) quieter than the average portable unit. If that doesn’t sound super impressive, bear in mind that the decibel scale is exponential, so something in this “low noise” category is actually many times quieter than a standard model. We generally suggest 60 decibels as a threshold because that’s what’s considered the level of an average conversation. Portable generators are available starting around $200, and they can easily cost as much as $5,000+, depending on the power class, the brand, and the features. When you’re shopping for a quiet portable generator, you’ll want to plan to spend on the higher end of the spectrum. Noise reduction is one of a few features like oil shutoffs, electric starts, and sine wave inversion that tends to be found only in mid to upper range models. We’d recommend spending at least $500 for any new low-noise generator. If you’re looking on the smaller end of the spectrum, you’ll probably be looking at a price tag between $500 and $1,000. That’s our general benchmark for small units that can power a camper or RV amenities, or an outdoor party quietly. If you’re looking for something quiet that can back up your whole house, plan on spending closer to the $5,000 threshold. You’ll find 7000W generators starting around $1,000, but these models tend to be very loud and unreliable. We’d recommend spending in the $4,000 to $5,000 range for something more efficient, reliable, and most of all, quiet. Still searching for your ideal power station? Head over to Amazon to see all their current best-selling portable generators!